What says Christmas like a beautiful personally made stocking stuffed with goodies?! 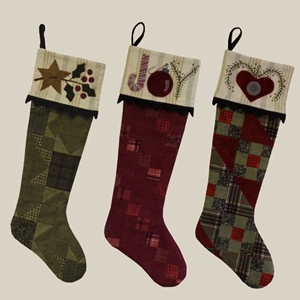 Here’s a few of the stocking patterns available. 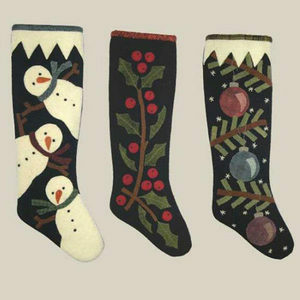 The 3 Christmas Stockings Pattern by Bonnie Sullivan of All Through The Night gives you a choice of snowmen, holly, or branches with ornaments. Better yet, make all three. Optional hanging “fringe” adds a little pizzazz. 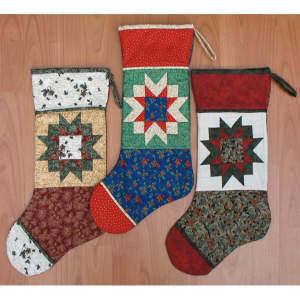 Winter Star Stocking Pattern features a beautiful pieced star with lots of color options as the focal point. The rest of the stocking is also pieced so this is a great pattern for scraps. The top section is just a bit larger than the rest of the stocking so you can get that really stuffed look! 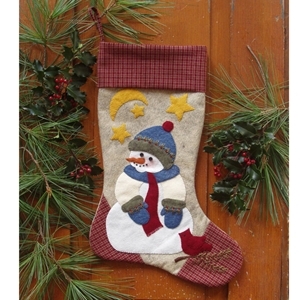 The Stockings Were Hung pattern (another by Bonnie Sullivan) has a pieced body, and applique on the cuff. A little hand embroidery is also part of the pattern. These old fashioned looking stockings are a bit long – lots of room for goodies. Snowman Stocking is hanging out at night with his cardinal friend. This adorable stocking is also available as a kit, with the pattern and all the fabric you’ll need to complete the project. 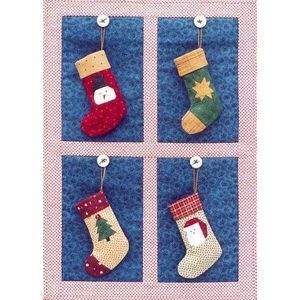 Make these Stocking Ornaments to hang on the tree, or sew up the window and hang them there. Cute either way! Have you ever made doll clothes or accessories? They are so cute, and are relatively quick to make, and they sure make the dolls’ mommies happy! My Camping Gear has instructions for a zippered sleeping bag and a backpack, both sized for an 18′ doll. The backpack is so cute! It has a zippered top, pockets on the side and a flapped pocket on the back. The Backwoods Bungalow works for “camping trips” in the backyard or for pretending in the bedroom. Window flaps roll up for “air circulation” (and so you can peek inside). 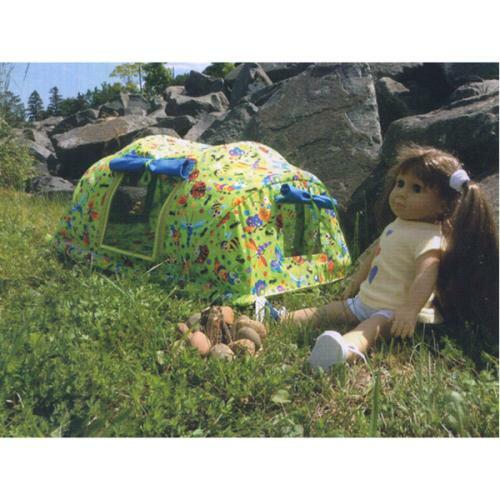 There’s room for two, so dolly can invite a friend to go camping with her. 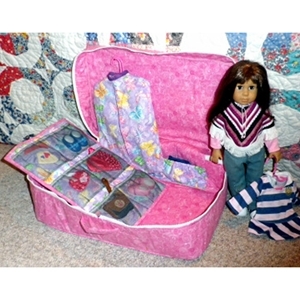 For the more style conscious doll, here’s a case that will hold her wardrobe when she travels. It measures 20.5″ x 12″ x 8″ and has an elastic pocket for those loose items. Also included in the pattern are instructions for an accessories bag with 12 pockets for shoes, purses, etc. and instructions for a garment bag. Again, so cute! You’ll find several patterns in Child’s Play. The doll sized wall hanging boasts (in embroidery) “My First Quilt”. Two more quilt patterns are sized at 22.5 x 26.5 and 11.75 x 15.75. Plus there are instructions for pillows, a rope bed, mattress, and tea party napkins. Lots of little projects to delight the little ones in you life! 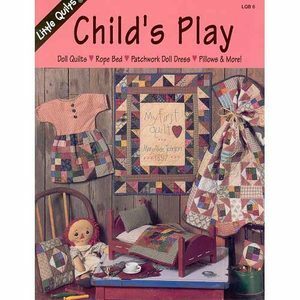 So many of us learned to sew by making doll clothes, before graduating to full sized clothes and quilts. Have fun with these patterns, reminisce about your first sewing days, and share the fun with a new sewer. We’re Thinking Spring In A Big Way! One day winter WILL end and spring WILL arrive! We’re trying to hurry it along by thinking about, and working on, spring patterns! Soon the birds will be courting and building their nests. Spring Row Quilt pattern by Carolyn Beam of Colorado Quilts has 11 birdhouses, 28 flowers, and three birdhouse poles covered in ivy leaves and vines….a bird’s paradise! Foundation piecing, applique, and traditional piecing are all used to create this beautiful spring quilt that measures 62″ x 80″ when finished. Brush up on old technique skills or learn some new ones with Linda Zokan’s Ode To Spring sampler pattern. Paper foundation piecing, broderie perse, hand embroidery, and applique make this fun for experienced quilters and it’s great for beginners to sample new techniques. Birds, bees, bugs, and bunnies all dance around the flowers to remind us of spring. Finishing at 31″ x 35″, it’s the perfect size for a wall hanging to celebrate the season. Remember Spring? A dozen butterflies pose amidst bright, cherry, spring fabric and entice us to look a little closer at their beautiful designs. 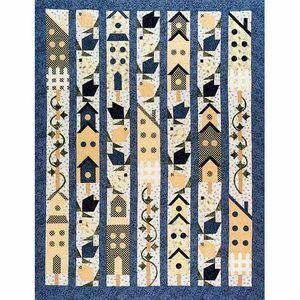 This 52″ x 64″ pattern is available in either hand embroidery or machine embroidery. You could also use the patterns individually on tea towels or throw pillows. 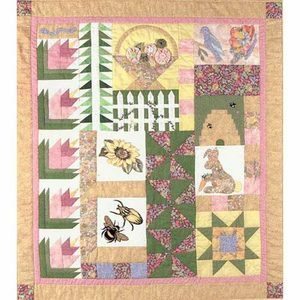 Bright colors in log cabin blocks frame four large spring themed appliques, all bordered by smaller Pieces of Spring. This one finishes at 44″ square and would look great on a wall or tossed on a couch or easy chair. Shake off the winter blues and bury yourself in some spring projects instead of snow! Alene Ward designs a wide variety of patterns. Her redwork ‘Me and Grandma’ and ‘Me and Grandpa’ designs are quite popular. They are great for take along projects or evenings in front of the TV. The Me and Grandma designs are also available on CD for machine embroidery. Alene’s applique designs are inspired by nature, with flowers and birdhouses. It’s a memory in the making, Me and Grandma in the Garden planting flowers. This 9″ x 12″ (unfinished) redwork block can be framed and considered done, or make the rest of the Grandma and Me blocks for an entire quilt of twelve blocks all about “me and Grandma”. Not to leave anyone out, here’s one of the Me and Grandpa blocks. 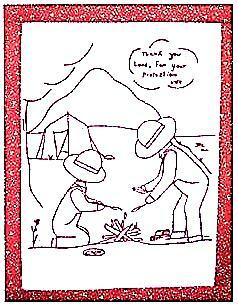 This, also, could be a simple little wall quilt, or part of a larger six block quilt all about “me and Grandpa”. Irises for Grace is a beautiful wall hanging measuring 24″ x 42″. The flowers look three dimensional, don’t they? 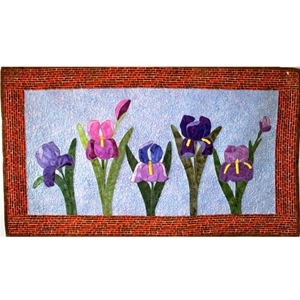 These irises can also be a part of a larger quilt (86″ square) of the same name, Irises for Grace quilt pattern. 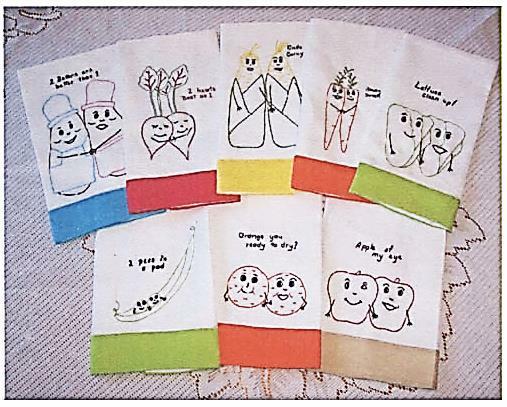 Nostalgic Fruit and Veggie towels will bring a smile to your face… and to anyone who enters your kitchen! Cute sayings are on each of them appropo to the fruit or veggie shown. 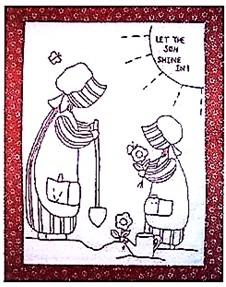 Choose to stitch as redwork, match the towel border, or the color that suits the fruit or veggie. These would make a great hostess gift. 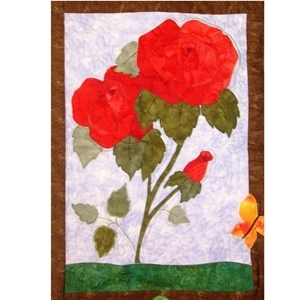 One block of a large quilt called Nature’s Beauty, Roses Block #9 lives up to the claim. Batiks would shine in all the blocks of this quilt…. lots of variations in color – just like in nature! 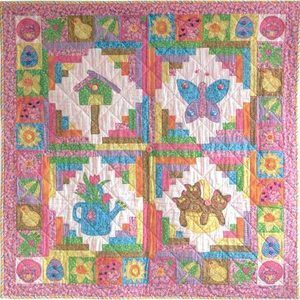 Other blocks in the quilt include baskets, lilies, tulips, birdhouses, and more. Designs by Alene also has a pieced Christmas table runner, a few combination pieced and appliqued holiday designs, plus a few patterns for practical items. Some quilt books are useful over and over, for years and years. Do you dread the words “quilt as desired”? Here’s help! 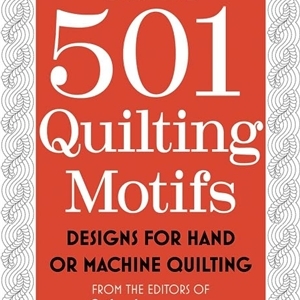 501 Quilting Motifs is a collection of quilting designs from more than 25 years of Quiltmaker magazine. The designs are indexed by size and style so you can easily find what you need. Flowers, vines, children’s themes, feathers, seasons, and more are included. Helpful diagrams for combining designs guide the beginner, and make projects easier for the more experienced. Use the designs as shown, or use them for inspirations. You’ll refer to this book often. 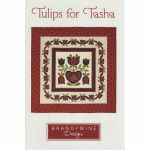 Brandywine Designs Clip Art for Quilters includes over 75 designs that you can freely use for a variety of projects. Embroidery, redwork, applique, labels, and stencils are just some of the uses. Flowers, animals, hearts, baskets, and more! Since they are drawn in the same style, combining several into one project will create a cohesive look. Combine, separate, or use just the way they are. 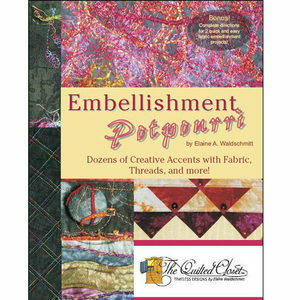 If you ever feel like you want to go one step further with your quilts, Embellishment Potpourri will give you the confidence to do so. Techniques are covered with fabric, thread, beads, and more. Plus there are instructions for two quick and easy fabric embellishment projects so you can “get your feet wet”! Do you know any quilter that does not have scraps? We all have them! And they just grow and grow! 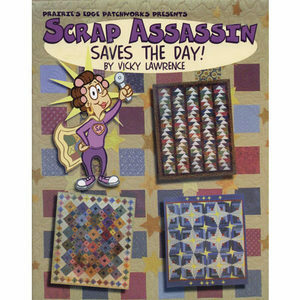 Never fear, Scrap Assassin Saves the Day! Instructions are included for four quilts – and yardage is given just in case you don’t want to use scraps. You can make these over and over again as each bundle of scraps will give you a different look. Plus you get the added bonus of using at least SOME of your scraps – that makes room for more new fabric! If you are looking for a few books to start your quilting library, these might be the ones to choose. 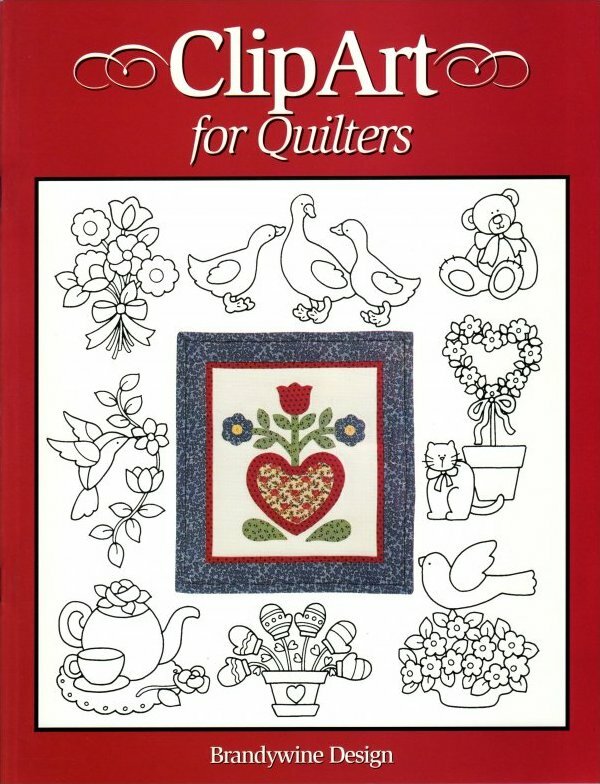 But don’t stop here – check out the rest of the books in our quilting book section. Margaret Travis creates patterns for useful items . . . handbags, accessories, home decor, special needs items. The patterns work for all levels of quilters and sewers, from the beginner to the experienced. If you are a beginner, experience a finish! 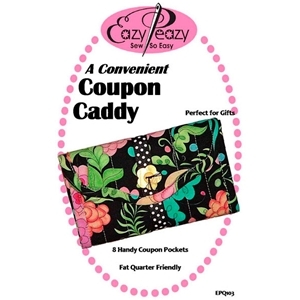 Convenient Coupon Caddy, a fat quarter friendly project, has eight pockets for organizing all your coupons. Save money and look stylish doing it! Folds to 6.5″ x 4″ so you can tuck it in your purse and have your coupons when you need them. Large, handy pockets and comfortably placed neck ties will make this a favorite apron. 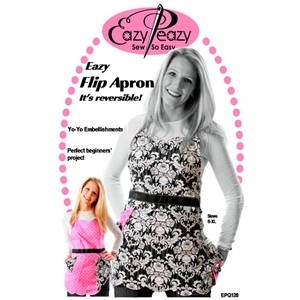 An easy to make, comfortable, reversible apron, the Eazy Flip Apron pattern fits many sizes and instructions are included for larger sizes. The pretty scalloped hem is optional. 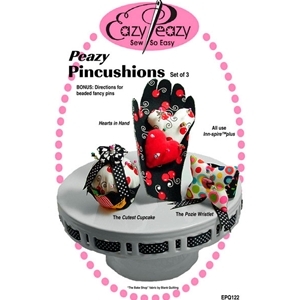 Who couldn’t use another pincushion?! These are super cute…. a “Cutest Cupcake”, a totally unique “Hearts in Hand”, and a handy “Pozie Wristlet”. Bonus! You also get instructions for making fancy beaded pins. Got stuff to hold? Make up the Eeny, Meeny, Miny & Moe Accessory Bags and you’ll have a place to hold it all. Great for cosmetics, cell phones, IPads & Kindles, sewing tools, anything! Fat quarter friendly, it would be fun to match the fabric to the items it will hold…. maybe a wordy fabric for an e-reader, or sewing themed fabric for sewing tools. Check out the Bodacious Brag Bag. Lots of room and lot of pockets. Ribbon is used for the handles and for embellishment. The vinyl pocket on the front holds a photo or an embroidered piece or anything else you’d like to brag about! 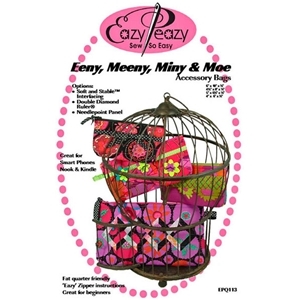 These are just a few of Eazy Peazy‘s patterns. There are many more, including a Spectacular Spectacle Case, Luverly Luggage Tags, a Walker Saddlebag, a Wheelchair Backpack, and more.